During the last ice age (the Last Glacial Maximum or “LGM,” 30-19 thousand calibrated years before present (cal ka), also referred to as Marine Isotope Stage 2), massive sheets of ice covered much of Eurasia and a large portion of North America. During this time, the Arctic Basin around the North Pole would have been uninhabitable by whales, seals and polar bears due to thick perennial (year round) ice, forcing these marine mammals into the North Atlantic and North Pacific. The LGM drew to a close about 19ka when temperatures began to rise and all this ice began to melt. Eventually, temperatures rose to levels higher than they are today in Arctic regions: warming began first and most rapidly in the western Arctic, around the rapidly-emerging Bering Strait (from about 12.8 to 9.8 cal ka), while the Atlantic lagged behind by a few thousand years (Kaufman et al. 2004). The Central Canadian Arctic and north-central Canada (including Hudson Bay) lagged even further behind. Figure 1. At 13,000 years ago, the central Arctic Basin and Baffin Bay – colored blue in this map – were free of sea ice in the summer as they are today, making them available polar bear habitat (land is black). However, the Laurentide Ice Sheet that remained over central Canada (area in white) excluded polar bears and ringed seals from the Canadian Arctic Archipelago and Hudson Bay, which today are home to more than half of the world’s polar bears. This map is fig.1 from Condron and Winsor (2012 in press). By 11,500 BP or so, after the Younger Dryas cold period, the Bering Sea and central Arctic Basin were almost as they are today, although many islands were larger than now because sea level was still lower (Guthrie 2004). In the eastern Arctic, the presence of numerous polar bear fossils in southern Norway, Sweden and Denmark indicates that winter ice extended further south, until about 10,000 years ago, than it does today (e.g. Berglund et al. 1992; Hebbeln et al. 1998:145). 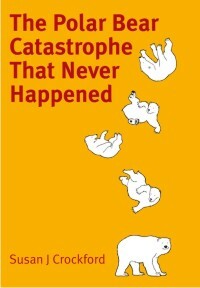 [more on the fossil record of polar bears in a future post]. However, a large remnant of the Laurentide Ice Sheet sat over Hudson Bay and many of the central Canadian Arctic islands, excluding polar bears and ringed seals from these regions. At the continental margins of the remnant Laurentide ice sheet, melt water began to accumulate behind the massive glacier as temperatures rose. In the east, there existed the so-called “Champlain Sea”, which was an extension of the Atlantic Ocean that flooded a large region either side of what is now the St. Lawrence River from about 13,000 to 10,000 years ago. Bones of ringed seals and other Arctic marine seals, as well as beluga – all known prey of polar bears – have been found in ancient Champlain Sea deposits, but so far no polar bear bones have been found (Haringon 1988, 2003). To the south-west of the ice mass, a huge freshwater lake – glacial Lake Agassiz – filled much of the basin that is now Hudson Bay plus an enormous area to the west and south, which was blocked by a dam of ice at the north end. When that ice dam broke, about 8,200 BP (years before present), a connection with the Arctic Ocean was established that froze over every winter. This short-lived body of water is referred to as the Tyrrell Sea (Bilodeau et al. 1990:961), see fig. 3 below. As a consequence of this lingering Laurentide ice mass, Hudson Bay was not suitable polar bear habitat until at least 8,000 and perhaps closer to 6,500 years ago (because of the rapid on-going changes to the currents and shoreline) (Bilodeau et al. 1990:961; Dredge 1992:11), see fig. 4. We cannot be certain whether polar bears or ringed seals (their primary prey) lived in the Tyrrell Sea or in early Hudson Bay because no polar bear or ringed seal fossils have been found in early or late Holocene geological deposits around the Tyrrell Sea or Hudson Bay (Harington 2003). Figure 4. After the ice had melted about 7,800 years ago, the shore of Hudson Bay was still depressed due to the weight of the Laurentide Ice Sheet. It has been slowly rebounding since then. 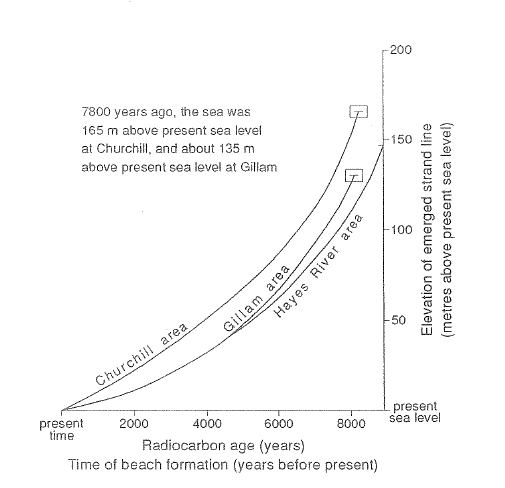 As this graph shows, Churchill (on the west coast of Hudson Bay) would have been 165m under water 7,800 years ago and the Hudson Bay shoreline would have been well inland from its present position. By 2,000 years ago, sea level would have been about 25m above present levels and the shoreline perhaps several kilometers inland from its present position. This means that coastal sites once occupied by ancient people – and any maternity dens of polar bears – will be found inland from the present coast. Graph from Dregde (1992:11). 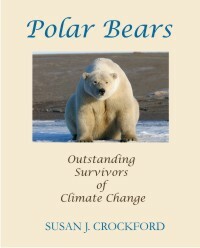 Only a few polar bear bones have been found in prehistoric archaeological sites around Hudson Bay, including those from the late Holocene (Harington 2008; Hodgetts and Eastaugh, 2006; Murray 2008; Nash 1976), suggesting polar bears were not hunted extensively by aboriginal inhabitants of this region. Some maps showing known North American archaeological sites are copied below, one at about 5,000 BP and another about 1,000 BP (fig. 5 and 6). Figure 5. 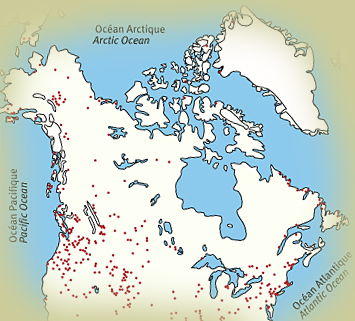 Map showing known North American archaeological sites at about 5,000 BP (years before present), note none around Hudson Bay. Courtesy Canadian Museum of Civilization, R. Morlan. Figure 6. 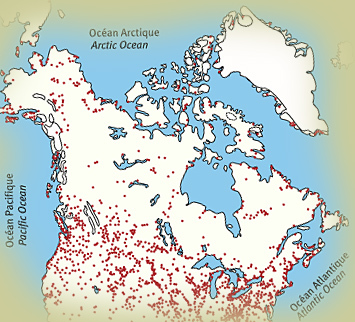 Map showing known North American archaeological sites at about 1,000 BP (years before present), note very few around Hudson Bay. Of these, where bones have been preserved, there are only a few polar bear bones. Courtesy Canadian Museum of Civilization, R. Morlan. 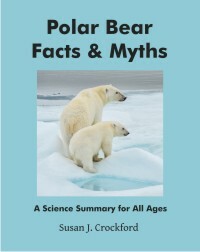 In summary, the evidence indicates that from at least 14,500 years ago until about 8,000 years ago at the earliest, there was polar bear habitat in and around the Arctic Basin but NOT in Hudson Bay. This means that polar bears have only had at most 8,000 years – and perhaps as few as 6,500 years – to adapt to the unique conditions of Hudson Bay, which includes a yearly ice-free period of 4 months or more (see previous post here. Berglund B.E., Håkansson S. & Lepiksaar J. 1992. Late Weichselian polar bear (Ursus maritimus Phipps) in southern Sweden. Sveriges Geologiska Undersökning, Series Ca. 81: 31–42. Bilodeau, G., de Vernal, A., Hillaire-Marcel, C., and Josenhans, H. 1990. Postglacial paleoceanography of Hudson Bay: stratigraphic, microfaunal, and palynological evidence. Canadian Journal of Earth Science 27:946-963. Condron and Winsor 2012 in press. Meltwater routing and the Younger Dryas. Proceedings of the National Academy of Science USA. Dredge, L.A. 1992. Field Guide to the Churchill Region, Manitoba: Glaciations, sea level changes, permafrost landforms, and archaeology of the Churchill and Gillam areas. Geological Survey of Canada Miscellaneous Report 53. Guthrie, R.D. 2004. Radiocarbon evidence of mid-Holocene mammoths stranded on an Alaskan Bering Sea Island. Nature 429:746-749. Harington, C.R. 1988. Marine mammals of the Champlain Sea, and the problem of whales in Michigan. Geological Association of Canada Special Paper 35:225-240. Harington C.R. 2003. Annotated Bibliography of Quaternary Vertebrates of Northern North America. Toronto: University of Toronto Press. Hebbeln, D., Henrich, R., and Baumann, K.-H. 1998. 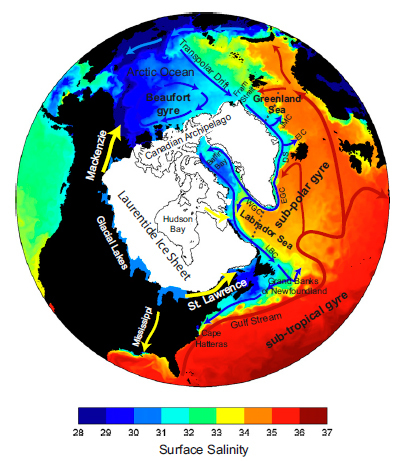 Paleoceanography of the last interglacial/glacial cycle in the polar North Atlantic. Quaternary Science Reviews 17:125-153. Hodgetts, L. and Eastaugh, E. 2006. Archaeological investigations on the Churchill West Peninsula, Manitoba 2005 (Heritage Permit # A16-05). Unpublished report prepared for The Historic Resources Branch, Manitoba Culture, Heritage and Tourism, Winnipeg. Kaufman, D.S., Ager, T.A., Anderson, N.J., Anderson, P.M., Andrews, J.T., Bartlein, P.J., Brubaker, L.B., Coats, L.L., Cwynar, L.C., Duvall, M.L., Dyke, A.S., Edwards, M.E, Eisner, W.R., Gajewski, K., Geirsdóttir, A., Hu, F.S., Jennings, A.E., Kaplan, M.R., Kerwin, M.W., Lozhkin, A.V., MacDonald, G.M., Miller, G.H., Mock, C.J., Oswald, W.W., Otto-Bliesner, B.L., Porinchu, D.F., Rühland, K., Smol, J.P., Steig, E.J. and Wolfe, B.B. 2004. Holocene thermal maximum in the western Arctic (0-1800W). Quaternary Science Reviews 23:529-560. Nash, R.J. 1976. Cultural systems and culture change in the central Arctic. Memoirs of the Society for American Archaeology 31 (Eastern Arctic Prehistory: Paleoeskimo Problems):150-155. This entry was posted in Sea ice habitat and tagged Derocher, early Holocene, geological history, Hudson Bay, ice age, last glacial maximum, LGM, marine isotope stage, polar bear evolution. Bookmark the permalink.